As you may well know, Disney’s Caribbean Beach Resort is going under a very extensive refurbishment, with many areas of the resort closed as things get reworked. 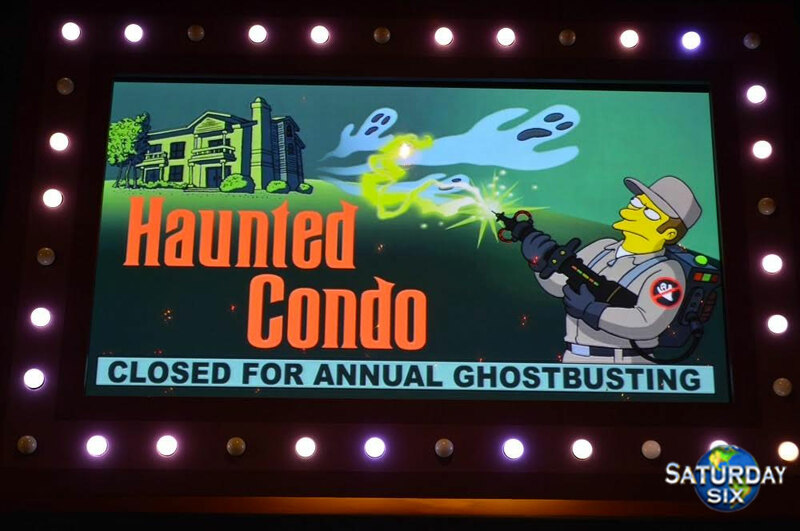 Today, we got some additional news as to what to expect when the resort comes out of this refurbishment. First, while it was initially announced that Shutters would be returning. However, there’s been a bit of an update to the name of this restaurant moving forward. You see, when Old Port Royale is complete, the former table service location, Shutters, will open in an all-new location and it will now be known as Sebastian’s Bistro! You know, themed after the favorite crab from The Little Mermaid. Sebastian’s Bistro will be located along the Old Port Royale waterfront and will feature beautiful views and a menu that blends Latin and Caribbean flavors from market-fresh ingredients. 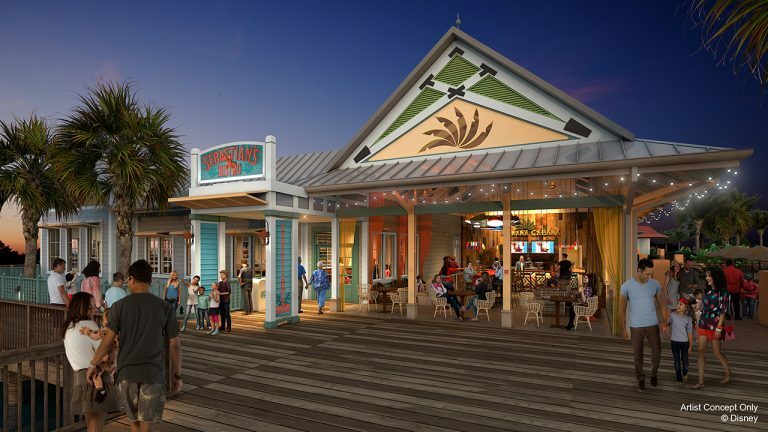 The restaurant will feature a casual, family-friendly feel, with the feel of stepping inside a tropical beachfront home. Personally, I love the look a feel of this restaurant, courtesy of the concept art. 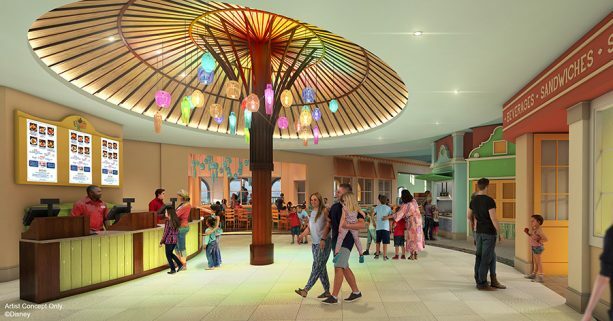 The quick service location will be known as Centertown Market and Guests will enter under a large palapa-like structure that is accented with glowing, colored light pendants made from glass bottles. When it reopens, Centertown Market will be expanded to create an indoor street market vibe that will feature open shutters, wooden light posts, awnings, ornamentation and unique seating areas. You will have access to the Grab n’ Go market for specialty coffee and quick bites. 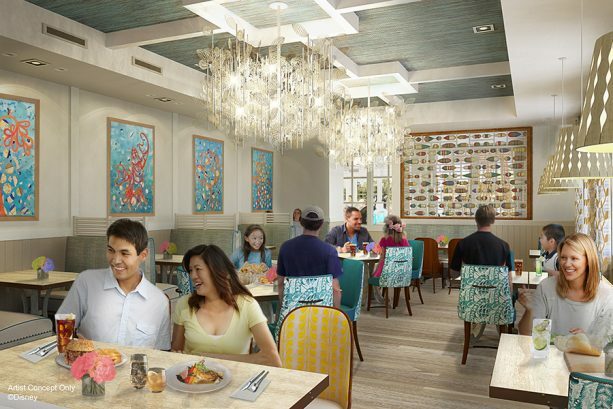 Stay tuned to the blog for more information about these two new restaurants, as well as additional updates in regards to the rest of the work being done at Disney’s Caribbean Beach Resort. 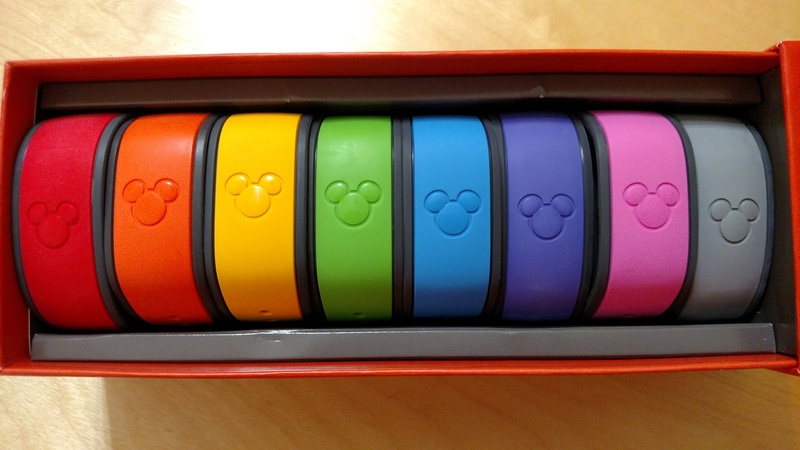 ← #AskIt: Marvel, Star Wars, and Pixar – Best Acquisition? Any idea when these will be available? I’m staying there in December and it would be very nice if everything was open by then, but I’m not counting on it.